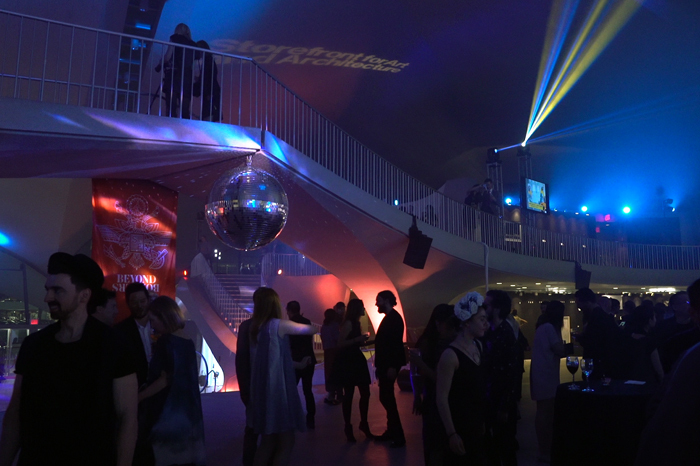 Storefront for Art and Architecture’s annual Spring Benefit took place this year in the landmark TWA Flight Center at JFK International Airport, originally designed by Eero Saarinen. WorldStage provided the lighting, sound and video technology for the gala evening, the last public event held at the landmark terminal before its redevelopment as a luxury hotel. Storefront for Art and Architecture is an organization that explores the forces shaping the built environment today. With the theme “Beyond Borders,” its Spring Benefit reflected upon a growing collective consciousness about spaces of difference and the desire to transcend them. The evening honored architect Teddy Cruz and architectural photographer and agency Ezra Stoller/ESTO/Erica Stoller. It featured an auction, live music and dancing, a series of events and performances by artists, and a number of installations. Once again WorldStage donated its time, creativity, equipment and labor for the Spring Benefit. WorldStage has supported previous Storefront galas at Manhattan’s Temple Court and 432 Park Avenue, the tallest residential tower in the Western Hemisphere. This year’s event was housed in the mid-century modern TWA terminal designed by Eero Saarinen to represent a bird in flight. It opened to the public in 1962 and has been out of use since 2001. The event also showcased some innovations from WorldStage San Francisco’s Inventions Group, including Blackbird 80 by DAL, an 80-inch transparent HD display, which greeted guests as they arrived. In a riff on modern travel, WorldStage used graphic content from Pentagram and the Blackbird 80 to create a faux airport scanning experience. As guests assumed the position inside a mock body scanner, a video loop of the “critical scanning process” revealed the guest to be one of a number of architecture “scalies” figures ranging from generic artists and travelers to the Venus de Milo, The Discus Thrower and The Thinker. Guests were admitted to the gala after their Storefront “password” was identified. WorldStage provided 50 Martin MAC Aura LED washes, supplemented by six Clay Paky Sharpys, automated lights and more than 70 Astera wireless LED floor pars that added impact and flexibility throughout the space. A complement of Sharp 70-inch monitors displayed pre-produced Storefront content and the live art auction and online bidding. A full audio package was supplied for speaker and DJ support, including a Yamaha DM1000 mixer, Meyer speakers and subs, and Shure microphones. For WorldStage Shelly Sabel was the Director of Design, Terry Jackson was the Vice President of Lighting, Alison May was the Project Manager, Susan Nicholson was the Lighting Programmer and Tim Becker spearheaded the Blackbird 80 installation.